In its 8th issue, Cidercraft Magazine — North America’s first print magazine dedicated to hard cider — showcased the orchards and cider producers from Adams County, Pennsylvania. Yes, it is the home of the legendary town of Gettysburg, who, in 1863…well, you know the story. Adams County, where Grand Illusion sources its apples, is the fourth largest producer of apples in the US and the biggest source of apples in Pennsylvania. 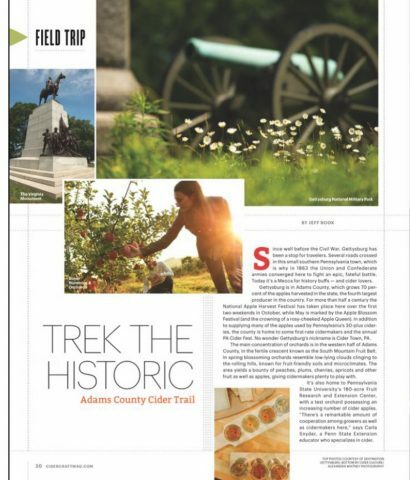 With over 20,000 acres of fruit trees, the micro climate of Adams County is friendly to apple farmers, which is wonderful to hard cider producers, and consumers of this fine libation. We are happy to see such attention given to our backyard. This is beautiful country, and we produce beautiful fruit. And when ground and pressed, Adams County apples make the most beautiful hard ciders. Cheers to our producers of hard cider; we appreciate and support you!